A "limited" Saudi-led force is on the ground in Yemen's strategic port of Aden and more troops are on their way, a government official has confirmed to AFP. About 20 troops have landed in the city for a "reconnaissance" mission, AP reports. "A limited coalition force entered Aden and another force is on its way" to Aden, the official and commander told the agency on terms of anonymity. The Saudi-led forces "will start helping us in fighting" the Houthi rebels, a leading member of the Popular Committees, also told the agency. The PC are a locally recruited militia loyal to expelled President Abd Rabbu Mansour Hadi. Similar reports appeared in the local Al-Ghad daily, which claimed the ground forces have entered the airport. The newspaper is linked to southern separatists, who demand the restoration of the southern state that merged with North Yemen 15 years ago. 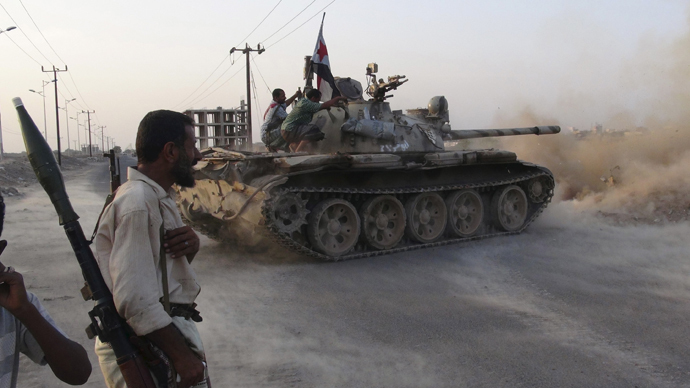 AP reports 20 troops were deployed by Saudi-led coalition in Aden. However, Ali al-Ahmed, spokesman for the Southern Popular Resistance, an anti-Houthi group, says there up to 50 Arab special forces soldiers. "Joint land forces from the Arab coalition landed in Aden on Sunday and are now participating with the southern resistance to fight around Aden airport,” he said. "It's a limited force - 40-50 from special forces." Al-Ahmed later retracted his statement saying the fighters in Aden were Yemenis. A spokesman from the Saudi-led coalition, Brigadier General Ahmed Asseri, also denied the claims saying the Arab states haven’t stared any major ground operation in the port. “There are no foreign forces in Aden but the coalition continues to help fight against the Houthi militia,” Asseri said in a statement. Fighting continued in the strategic port city of Aden on Sunday, local sources told Reuters, adding that the city has seen fierce battles for three days. The attacks were reported in the city’s central districts of Mualla and Khor Maksar, near the main commercial port, as well as around a military camp and the airport. The Saudi-led operation against Houthi militia forces has entered its sixth week. Nearly 1,250 people have been killed, and at least 5,044 people injured between March 19 and April 27, the World Health Organization said on Friday. Local estimates on the ground are much higher. Houthi rebels took control of the capital Sanaa in September 2014, in a move that forced Sunni President Abd-Rabbu Mansour Hadi to flee to Saudi Arabia. They are fighting to control of Aden, which is home to about 800,000 people. On April 21, Saudi Arabia said the first phase of the campaign, codenamed operation "Decisive Storm", had achieved all its goals and was concluded. The new phase, operation "Restoring Hope", was announced with a focus on diplomacy, but didn't rule out new airstrikes.